The Paseo de Reding is one of the most emblematic streets in Málaga. It links the old town with the east of the city, and its buildings are a clear example of the 19th century new bourgeoisie, who used renowned architects to design their homes. As well as this, on the avenue you can find the La Malagueta Bullring and the Museum of Municipal Heritage. Let's take a tour down this avenue! The Paseo, which runs parallel to the seafront, gets its name from General Theodor von Reding, military governor of Málaga and victor of the Battle of Bailén during the Spanish War of Independence against the French. It was the new bourgeoisie in the middle of the 19th century who started building the Paseo, relying on renowned architects of the era to build their houses, such as Jerónimo Cuervo and Joaquín de Rucoba. These picturesque houses have become the identifying feature of the Paseo. The Houses of Félix Sáenz. Numbers 37-39 and 41-43 of the Paseo are two of the buildings that most stand out. They are houses built in the regionalist style, decorated with Neo-Mudejar, Neo-Plateresque and Neo-Renaissance features and distinctive towers on the roofs. Félix Sáenz was a merchant who ordered their construction for the purposes of renting them out, and they are currently still in use as rented homes. Hospital Noble. Just before the start of the avenue is this Neo-Gothic style former hospital, built by the heirs of Joseph Noble, an English doctor who died of Cholera whilst on a trip to Málaga. La Malagueta Bullring. The bullring was built in 1874 in Neo-Mudejar style, by Joaquín Rucoba. It has been declared a Historical-Artistic Site and Bien de Interés Cultural (Heritage asset), and its events include the Picassiana and La Prensa bullfights, as well as the bullfights during the Málaga Fair. Inside, there is the Antonio Ordóñez Bullfighting Museum, in honour of the legendary Málaga bullfighter. Desfile del Amor Building. This is a modern-style residential building that has been declared a heritage asset. With one long inner courtyard and two courtyards to the rear, the building is one of the most recognisable on the Paseo. Palacio de la Tinta. Next to the Desfile del Amor (literally, “parade of love”) building is the old Palacio de la Tinta (Ink Palace), a building with a French influence, designed in the Parisian "fin de siècle" style. It was the work of architect Julio O'Brien, and got its name from the fact that it was originally home to the head office of the Andalusian Railway Company (Compañía de los Ferrocarriles Andaluces), and so large quantities of ink had to go through it every day, for issuing tickets by hand. Gran Hotel Miramar. Opened in 1926 by King Alfonso XIII and his wife, María Victoria Eugenia, under the name 'Hotel Príncipe de Asturias'; the King and Queen loved the hotel so much that the Queen reserved one of its wings and spent several summers here. 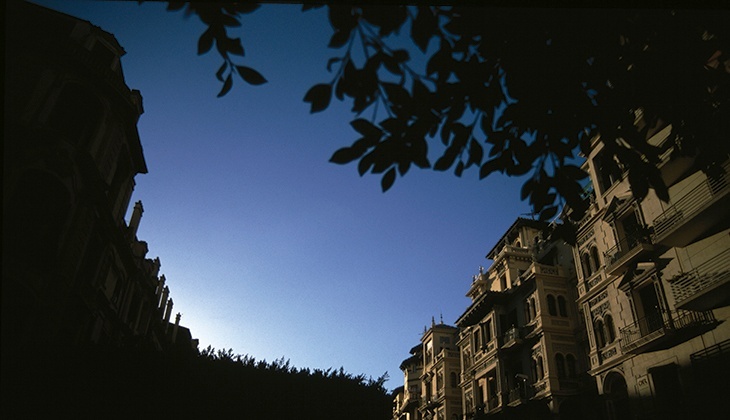 The hotel therefore became the most magnificent coastal accommodation of the first part of the 20th century. During the Civil War the building was turned into a field hospital, and returned to being a hotel when the war ended. The hotel has been used as the setting for films such as "Fire Over Africa", and many stars have stayed here, including Elizabeth Taylor, Ava Gardner, Orson Welles, Jean Cocteau, Anthony Quinn and Ernest Hemingway. 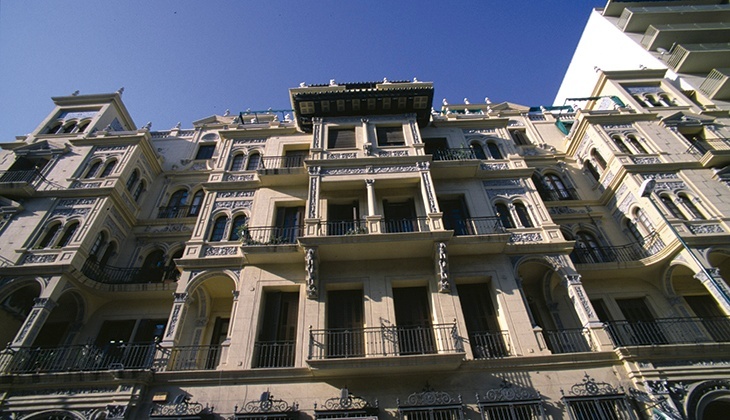 The building is currently undergoing renovation to turn it into one of the first 5 star superior luxury hotels in the city of Málaga, and its re-opening is planned for 2016.